Because there are times when we need to block those early sun rays for as long as possible in order to prolong our sweet morning sleep or to recover from the daily havoc with an afternoon snooze, installing opaque window treatments is crucial. 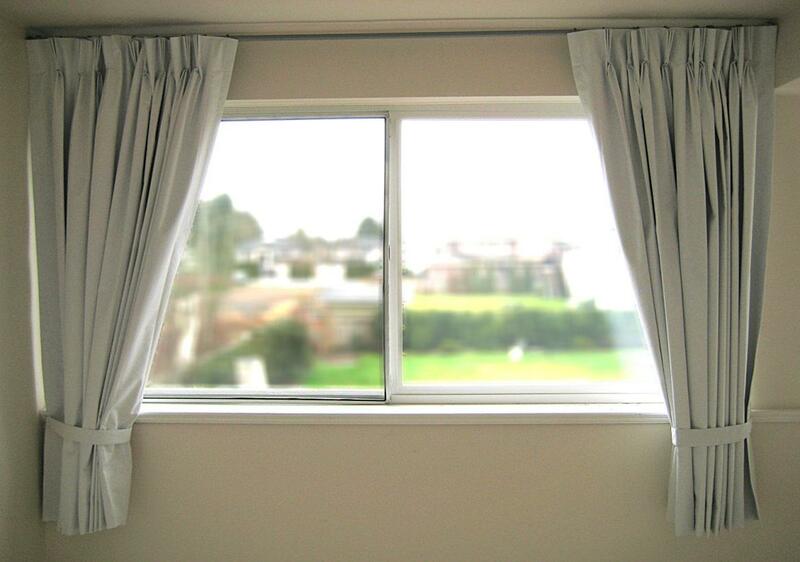 Blackout curtains provide by far the most elegant and versatile solution to dressing the windows. They will never become outdated because their presence can instantly elevate a space by bringing character and a subtle sense of lavishness. Besides their unquestionable decorative appeal, curtains also enable us to control the amount of light and privacy within a room. Nowadays, advanced materials contribute to reducing energy costs while making a classy visual impression, just like a dialogue between old and new. Because of their thickness, room-darkening fabrics can appear heavy and austere, but throw in some beautiful accessories and adjust their height, and plain becomes wow! 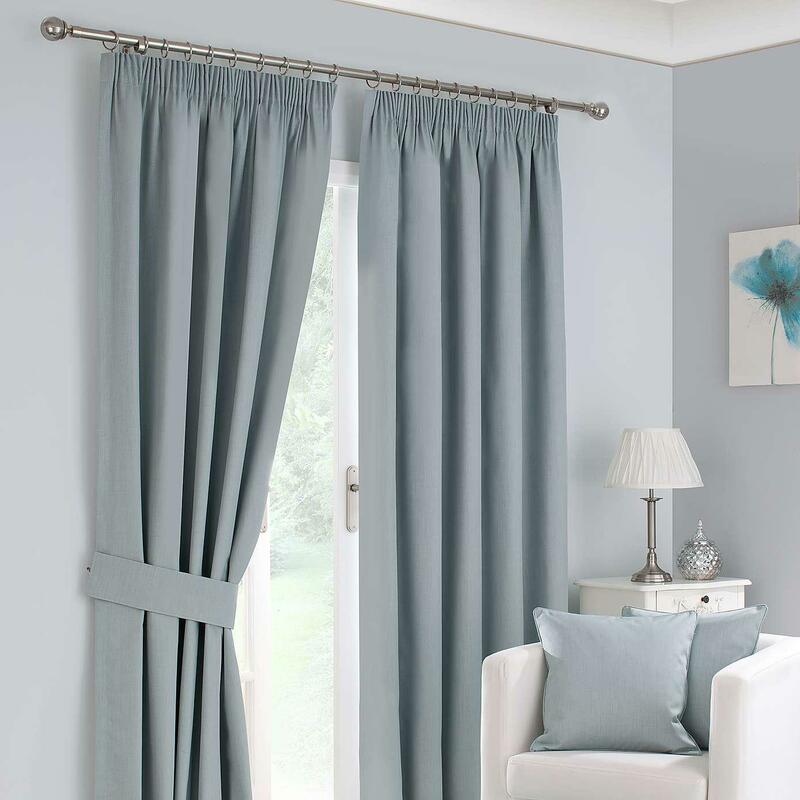 With such drapes, it is essential to follow a few styling tips in order to make the most of their attributes. Lining your textile pieces with a blackout layer is better than buying ready-made items; the latter solution will considerably limit the choices you have regarding texture and character. For understated glamour, select dense materials like velvet or taffeta whose allure will not be altered by the compact liner. Satin-like finishes will cast tiny flecks of silver or gold, making your weighty draperies appear as if they were floating. And in case you are going for contemporary panache, pick anything from color-blocking combinations, striking geometrical patterns or crisp neutrals. In either situation, the fabric should have the same length as the wall; if the furniture arrangements allow, let your coverings even puddle a little, for a luxurious touch. Likewise, keep in mind that their width has to be with at least 50% larger than that of the windows, in order to create sumptuous pleats when stacked back. The lining will give the original material more body and better draping, so the folds will always look chic and neat. Furthermore, blackout panels are very elegant as they frame the window from both sides; when dealing with large glass expanses, they anchor the space and balance the décor. Pair them with contrasting feather-light layers of chiffon or other sorts of sheer materials, for a truly stylish appearance. Also, additional adornments should not be overlooked, as decorative tassels, vintage tieback hooks and embellished rods can add classic refinement to your functional opaque drapes. 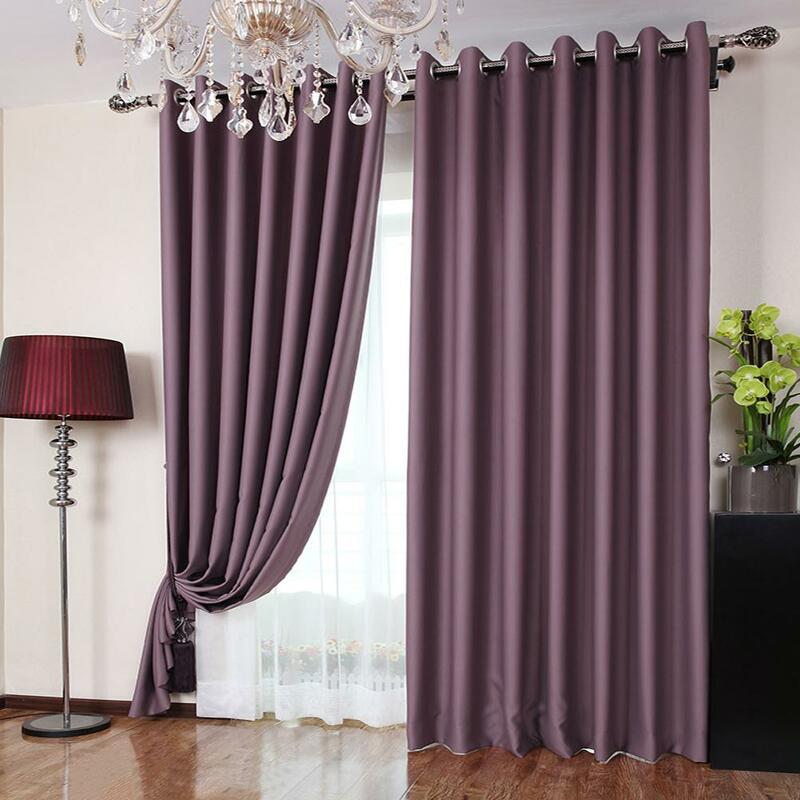 Due to the fact that the term ‘blackout’ contains a color reference, some people might think that having light-blocking curtains would mean sacrificing the wide range of neutral drapery fabrics available on the market in favor of dark heavy hues, but that is not the case. A blackout curtain liner can be sewn on the back of virtually any curtain (with the exception of light transparent ones that tend to crease), amplifying the opacity level and preserving the initial pattern. As a result, if you fancy modern designs and clean lines, you can also enjoy white room-darkening curtains that will brighten up the interior while blocking the sunlight. For extra pizzazz, add ruffles or decorative hems. 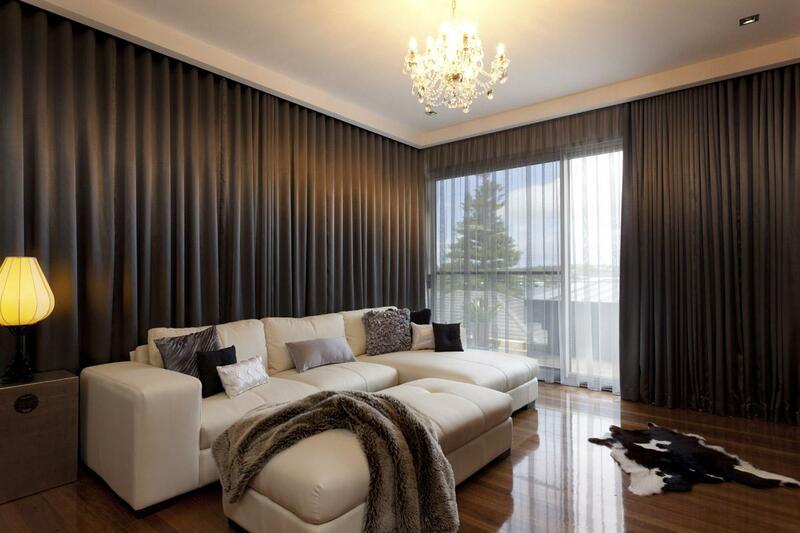 Your insulating window treatments will hang majestically, imparting a luxurious look. To combine function and beauty when using darkening materials for your windows, search for posh finishes and imposing colors that add character and charm to the overall décor. Design-wise, navy is the color of the moment for creating an extravagant ambiance. It simply goes with everything, from industrial copper pieces, natural stone and wooden artifacts, celebrating the best of contemporary trends and splendid retro influences. 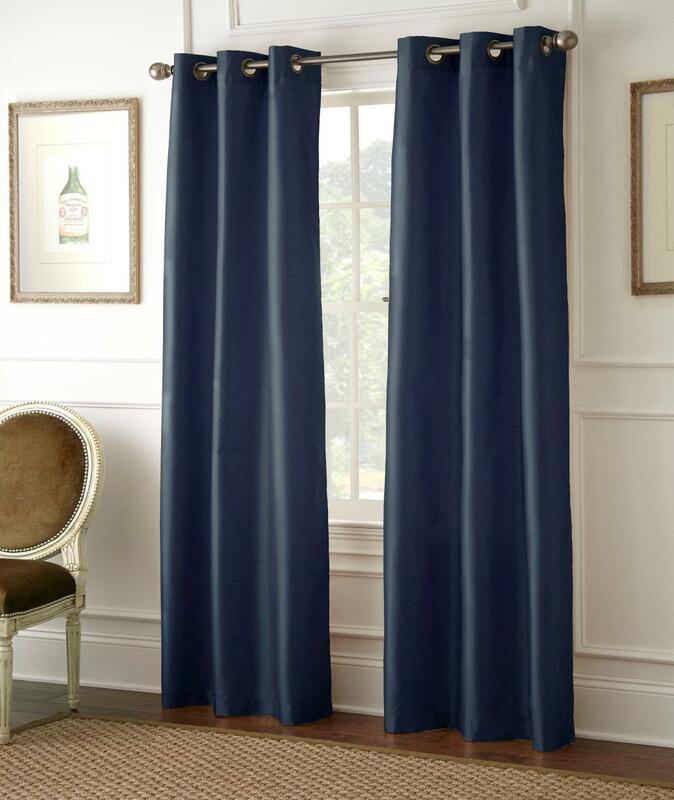 For larger rooms, navy blackout curtains with a satin appearance will reflect light, creating a feeling of intimacy and bringing together separate furniture items; smaller rooms can be enhanced with matte room-darkening draperies acting as a flattering backdrop for a minimalist approach in decorating. Curtains in this naval color will look dashing in your lounge and, what’s more, they have the perfect theatrical silhouette for a home cinema ambiance. Just drag them over your windows, grab a properly chilled beverage and enjoy your favorite film. Your incredibly practical blackout panels will eliminate the annoying glare and disturbing outside noises, while improving the sound with their thick fabric. 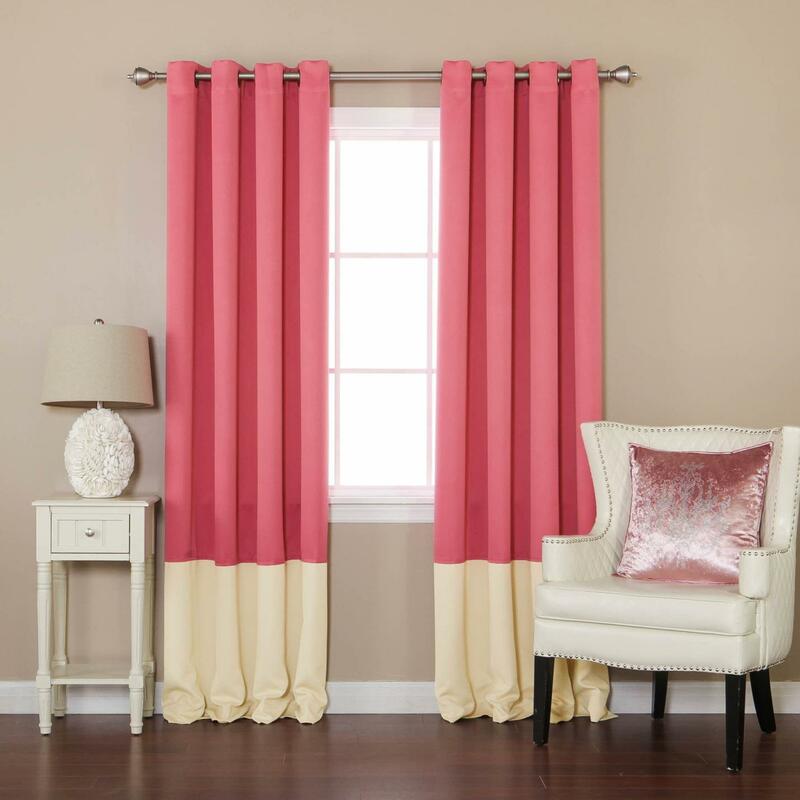 Pink in all its varieties is a popular color with blackout window fashions, entailing a striking visual impact when used on a fabric that does not allow any amount of light passing through that could alter the initial pigment. 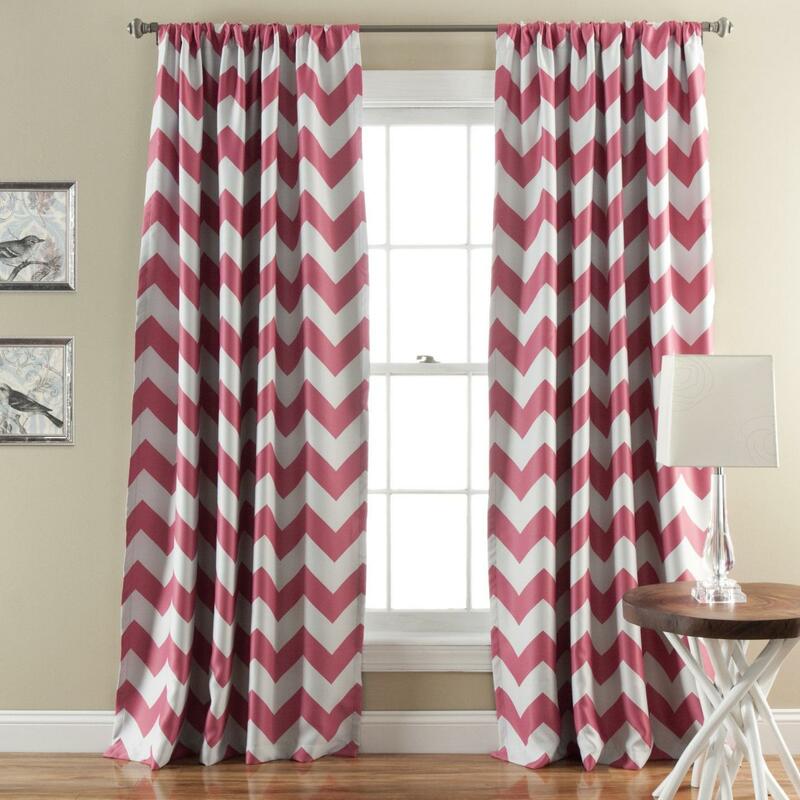 Curtains that feature this color with a slightly glossy finish inspire a romantic boudoir-like feel, while muted pink hues are more suitable for a girl’s nursery. Darker tints like fuchsia will work best with modern décor items, adding vivacious pops of color throughout. For a more reserved, less girly-girl look, go for simple patterns in horizontal stripes with complementing pastels that will tone down the bubbly character of your pink blackout curtains. Matching sheer panels could also be installed to generate a formal ambiance. Because the blackout inside layer will keep vibrantly-colored fabrics and ornate designs looking decorative without being altered by the sun, the space will gain a refined touch, by instantly becoming more appealing. A great way to get truly streamlined treatments is to look for geometric patterns such as Moroccan lattice or chevron; their beauty will never fade thanks to the insulating lining that offers protection against the damaging UV rays while enhancing their color-blocking effect. Blackout drapes are perfect for night workers’ bedrooms and for people who tend to be woken by early morning sunlight. Their noise-reducing qualities will also contribute to a good rest, which is essential for your health and wellbeing. For ultimate flexibility, opt for separate blackout panels that allow you to juggle with different amounts of light and shade, depending on the time of day or season. Their color can complement the other curtains, for a classic look, or can create a bold contrast, for a fashion-forward interior design. Also, by layering different fabrics and textures, the space will become more elegant and inviting, hence you will feel restored and energetic, as if you had been sleeping in a classy hotel suite. And speaking of precious naps, no one can appreciate a peaceful atmosphere more than a mom and her baby. It is well known that newborns lack the ability to differentiate between day and night, so blackout window treatments will help them adjust their inner clock and behavior. 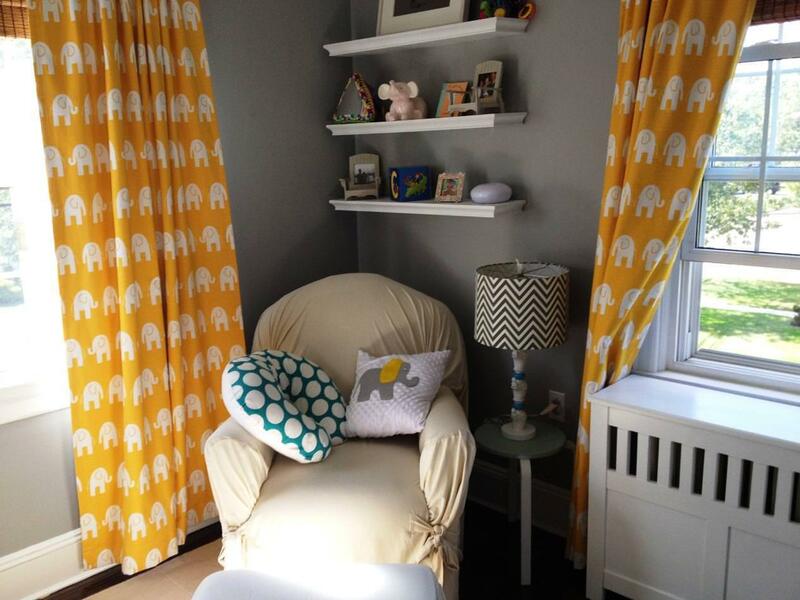 Brightly-colored light-blocking curtains are the best solution for a nursery, as they will keep your child entertained with their fun patterns while being awake, and calm and rested during sleep. Older tots might sometimes find it difficult to settle for their afternoon nap or can become early birds due to the morning sun. By opting for a fabric with blackout qualities, they can be encouraged to fall asleep easier in the afternoon and wake up a bit later every day. 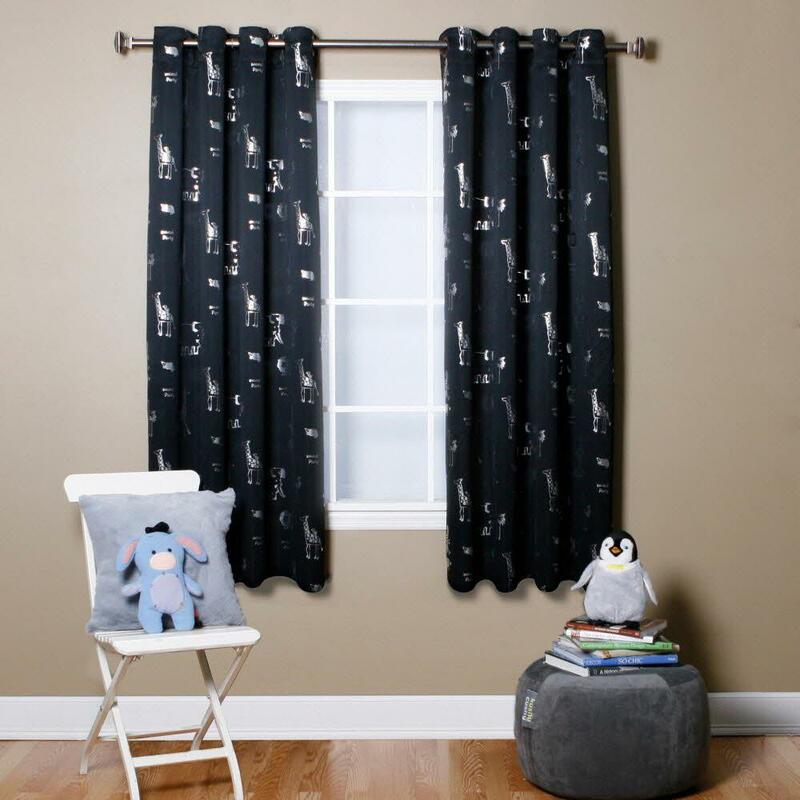 The soundproofing attributes of such drapes will also diminish the chances of your little one being startled by annoying lawn mowers or traffic noise. Small windows are not always easy to dress, due to their undersized appearance that alters the overall design of a room. If your intention is to install blackout treatments, then nailing the right size means paying attention to both the length and width of the fabric. Tiny windows that are wider than they are tall are particularly difficult to style with heavy materials like sun-blocking ones, because the window wall will end up looking unbalanced; in such cases, going for floor-to-ceiling spans won’t look very flattering. Try textiles that cover the frame and extend about 15 inches below the window sill; in this way, you will benefit from their darkening effect while keeping the décor pleasing and balanced. For tall and narrow windows, choose drapes that extend over the entire length of the wall, but do not exaggerate with their width. You want lavish folds that do not obstruct the glass area in order to maximize daylight when needed, and complete coverage when the blackout drapes are closed. Large windows illuminate grand spaces and can facilitate access to great views, but also require special attention when decorated with curtains, as it can be tricky to cover them efficiently during the day. Wide window expansions definitely require fabrics with blackout properties that enable advanced light control and privacy. Curtain panels are great in these situations, as they act as dividers and can visually balance the extended glass surface. 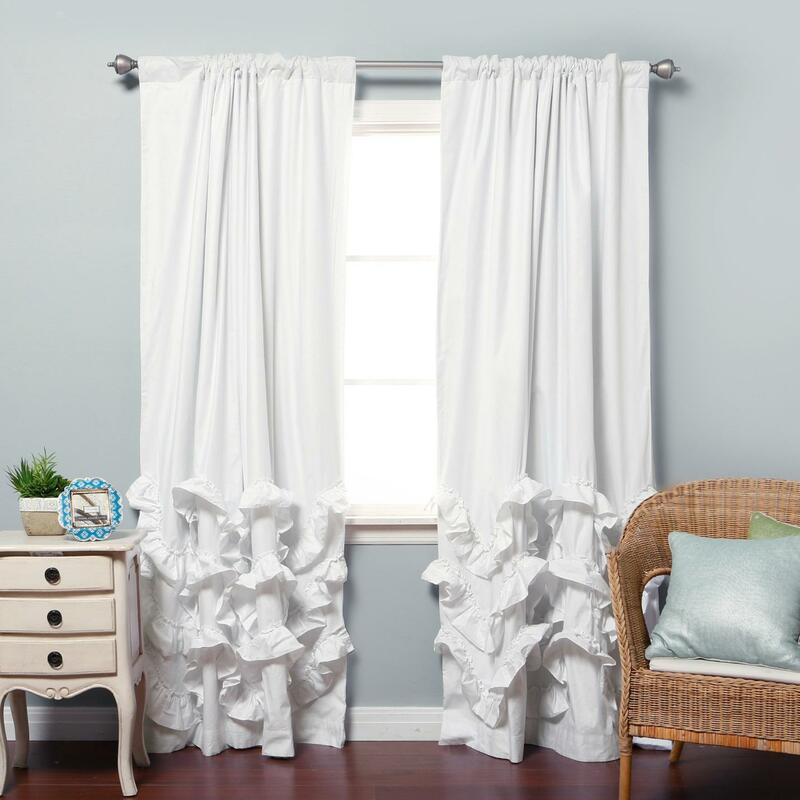 They also separate the material and prevent the drapes from over-stacking to the sides when open, thus creating a harmonious look. Keep things dramatic with lush accessories such as ornate rods and tassels, while allowing the textiles to drop elegantly onto the floor. Thermal blackout curtains are particularly important if your house features south-oriented rooms or you live in a hot climate. Not only do they block light from entering the room, but also reflect it, so that the inside temperature remains constant, hence the air conditioner gets used less. Also, during winter, they still keep their insulating role, but in reverse, preventing the heat from escaping through the windows, meaning you won’t run up huge utility bills. What’s more, the thick material that thermal curtains are made of will reduce outside noise, turning the indoors into a calmer space, suitable for complete relaxation. And if that wasn’t enough, this type of window fashions acts as a barrier against the sun’s burning rays by keeping the color of your furniture, upholstery and carpets in top shape. To conclude, with the improved materials available nowadays, you can create gorgeous blackout coverings for your windows, which also insulate against heat transfer, damaging UV rays and outside noise.